* Written for Kronos + Arranged for Kronos ** co-commissioned by Karen and Donald Evarts for the Philharmonic Society Brian H. Scott, Lighting Supervisor Scott Fraser, Sound Designer Exclusive Print Sponsor Photographing or recording this performance without permission is prohibited. Kindly disable pagers, cellular phones, and other audible devices. Although rare, all dates, times, artists, programs, and prices are subject to change. impersonators improvising and singing from a script I had created. My script contained lists of hotels, concert venues, films and people in Elvis’ life; quotes (confirmed and unconfirmed) and sayings such as Shakespeare’s “The World’s a Stage” (recited by Elvis at every performance); “Thank you very much” (often drawled by Elvis in concert after every song); “Elvis has left the building” (announced at the end of every Vegas concert). “Decades after the untimely death of Elvis at the age of 42, Elvis Everywhere makes an argument that Elvis continues to be “everywhere” and “everything” to millions of fans who experience vicariously the “King of Rock and Roll” through the performances of Elvis’ music by dedicated and passionate Elvis impersonators.” Elvis Everywhere was commissioned for the Kronos Quartet by the London Philharmonic Orchestra. wiley: last KinD worDs (c. 1930) In March 1930, Geeshie Wiley recorded “Last Kind Words” in Grafton, Wisconsin, for Paramount Records. Beyond this, very little information is confirmed about this singer’s life, though there are reports that she came from Mississippi. She recorded a second song at the same session, “Skinny Leg Blues,” and provided backup for a few additional tracks. Nevertheless, her recording of “Last Kind Words” has given Wiley the reputation of being perhaps one of the great early blues musicians. Blues scholar Don Kent has written, “If Geeshie Wiley did not exist, she could not be invented: her scope and creativity dwarfs most blues artists. She seems to represent the moment when black secular music was coalescing into blues.… Moreover, despite her sensual voice, the persona she presents is as tough as Charley Patton: money before romance and she sweetly says, while extolling her sexual charms, that she’s calmly capable of killing you… [Last Kind Words] is one of the most imaginatively constructed guitar arrangements of its era and possible one of the most archaic. Although the lyrics date it to the late World War I era, its eight-bar verse structure appears to be older.” The lyrics read, in part, “The last kind words I heard my daddy say: ‘If I die in the German war, please don’t bury my soul. Ah, child, just leave me out, let the buzzards eat me whole.’” Jacob Garchik’s arrangement of Last Kind Words was commissioned for the Kronos Quartet by the David Harrington Research and Development Fund. community of Ann Arbor, Michigan, in honor of Kronos’ 40th anniversary. volans: wHite man sleeps (1985) Kevin Volans was born in Pietermaritzburg, South Africa. After completing a Bachelor of Music at the University of Witwatersrand, Johannesburg, he went on to study in Cologne, principally with Karlheinz Stockhausen (later becoming his teaching assistant), Mauricio Kagel and Aloys Kontarsky. In 1979, following several field recording trips to Africa, he embarked on a series of pieces based on African compositional techniques which quickly established Volans as a distinctive voice on the European new music circuit. During this time he was active as a concert pianist and made several trips to Ireland. His love of the country made him decide to settle in Ireland. After moving to Ireland, Volans began a productive collaboration with the Kronos Quartet. White Man Sleeps (1986), Hunting: Gathering (1987), The Songlines (1988) and String Quartet No. 8 “Black Woman Rising” (2004) were all written for them. In the 1990s, Volans gave increasing attention to writing for dance, collaborating with companies around the world. In 1999, the South Bank hosted a 50th birthday celebration of his work in the Queen Elizabeth Hall. Of late, he has turned his attention to writing for orchestra and as well as collaborating with visual artists. In 2009, for his 60th birthday celebrations, there were concerts in Dublin, Madrid, London (Wigmore Hall’s “Kevin Volans Day”), and South Africa. About White Man Sleeps, Volans writes: “The light, the textures, the colors of Africa and the African landscape and the sounds of the birds and the insects are totally different from Europe. And the music draws on those elements. It’s not so much cultural as environmental. You can switch cultures, in a way, but you can’t deny your environmental background. “When Kronos asked me to do White Man Sleeps for them, I became interested in the issue of translatability. I have come to conclusion that the color of the instruments, or the color of the sound that they produce, is as important for the meaning of the music as the pitch, or the rhythms, or anything else.” White Man Sleeps was written for Kronos, and recorded on the Nonesuch CD Pieces of Africa. ratniece: silsila (2013) Latvian composer Santa Ratniece graduated in musicology and composition at J. Vītols Latvia Music Academy, and later continued her studies at Estonian Academy of Music and Theatre with Helena Tulve, where she obtained her MA in 2007. Ratniece first came into public view in 2004 after winning the 1st prize at the 2004 International Rostrum of Composers for her work sens nacre (in the category of composers under 30). Her choir composition Saline was among the selected works in the 2008 International Rostrum of Composers, and her orchestral piece was selected in 2012. About silsila, Ratniece writes: “In silsila (‘chain’ in Arabic), we follow the Brahmaputra River downstream from Tibet, through India and Bangladesh to the Bay of Bengal. It is the highest major river in the world, which starts as a tiny little spring in Angsi Glacier in the Himalayas. In the course of the piece we descend from 5,210 meters [17,000 feet] above sea level. The piece has seven undivided parts, which have titles in Tibetan. “1. ču-ri – hill of water. The river originates from the Angsi Glacier, located on the northern side of the Himalayas, southeast of Mount Kailash. A local name for the sacred mountain is Tisé meaning ‘Water peak’ or ‘River peak.’ This is where our journey begins. “2. ču-ῤrán – little river. Here the river finds its first waters as a small spring in Tibet. Sounds are almost inaudible. “3. báb-ču – descending water. The river enters India in the state of Arunachal Pradesh, where it is called Siang. It makes a rapid descent from its original height in Tibet, and appears in the plains. “4. ču-skád – voice of water. The river enters the state of Assam and is called Brahmaputra now, and becomes as wide as 10 kilometers. “5. ču rgyủn – continual flowing. In Bangladesh, the Brahmaputra splits into two distributary branches. The western branch, which contains the majority of the river's flow, continues south as the Jamuna to merge with the Padma River. Here the river loses its identity. “6. ču-gáṅ – full of water. Now we have reached the Ganges Delta, fed by the waters of numerous rivers, including the Ganges and Brahmaputra, the largest river deltas in the world. “Understanding and cultivating an aptitude for string writing is a deep and, apparently, endless undertaking. For all of those who have helped me in this regard— and certainly including the members of the Kronos Quartet—I remain forever grateful.” Philip Glass’s String Quartet No. 6 was commissioned for the Kronos Quartet by The Chan Centre for the Performing Arts in the Faculty of Arts at The University of British Columbia; Clarice Smith Performing Arts Center, University of Maryland, College Park, Maryland; Krannert Center for the Performing Arts, University of Illinois at Urbana-Champaign; Philharmonic Society of Orange County; The Smith Center for the Performing Arts, Las Vegas, Nevada; and David A. and Evelyne T. Lennette. The world premiere performance took place on October 19, 2013, at The Chan Centre for the Performing Arts at The University of British Columbia, Vancouver, Canada. aBoUt tHe Kronos QUartet For more than 40 years, San Francisco’s Kronos Quartet—David Harrington (violin), John Sherba (violin), Hank Dutt (viola), and Sunny Yang (cello)— has combined a spirit of fearless exploration with a commitment to continually re-imagining the string quartet experience. 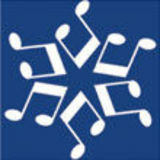 In the process, Kronos has become one of the world’s most celebrated and influential ensembles, performing thousands of concerts worldwide, releasing more than 50 recordings, collaborating with many of the world’s most eclectic composers and performers, and commissioning more than 800 works and arrangements for string quartet. A Grammy winner, Kronos is also the only recipient of both the Polar Music Prize and the Avery Fisher Prize. With a staff of ten, the non-profit Kronos Performing Arts Association (KPAA) manages all aspects of Kronos’ work, including the commissioning of new works, concert tours and home-season performances, and education programs. 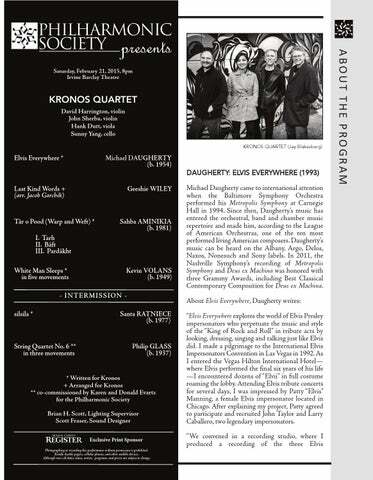 Management for the Kronos Quartet: Kronos Performing Arts Association P. O. Box 225340 San Francisco, CA 94122-5340 USA kronosquartet.org facebook.com/kronosquartet instagram.com/kronos_quartet Twitter: @kronosquartet #kronos The Kronos Quartet records for Nonesuch Records. silsila was commissioned for the Kronos Quartet by de Doelen Rotterdam, and by Peggy Dorfman and the Ralph I. Dorfman Family Fund in memory of Mike Beigler. No. 5. The string writing itself has taken on a denser, thicker texture, at times sounding like quintet or sextet music.